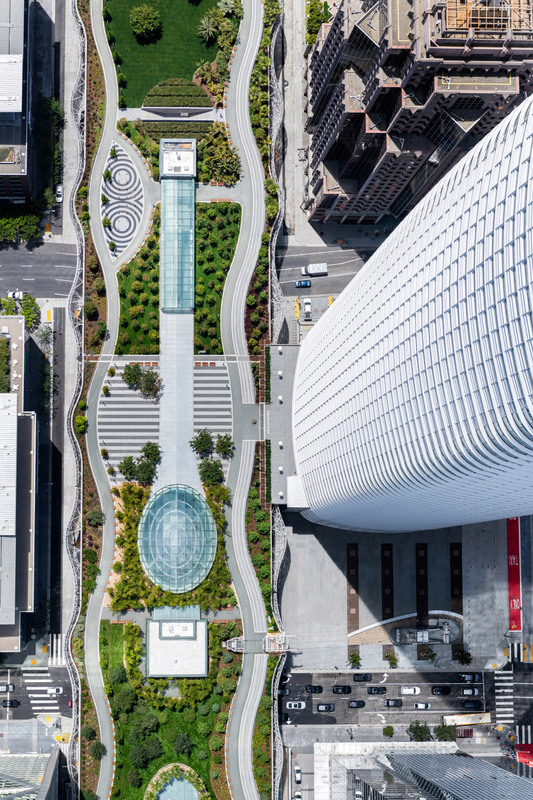 The Pelli Clarke Pelli Architects (PCPA)–designed Salesforce Transit Center and its 5.4-acre rooftop park in San Francisco are now officially open to the public. 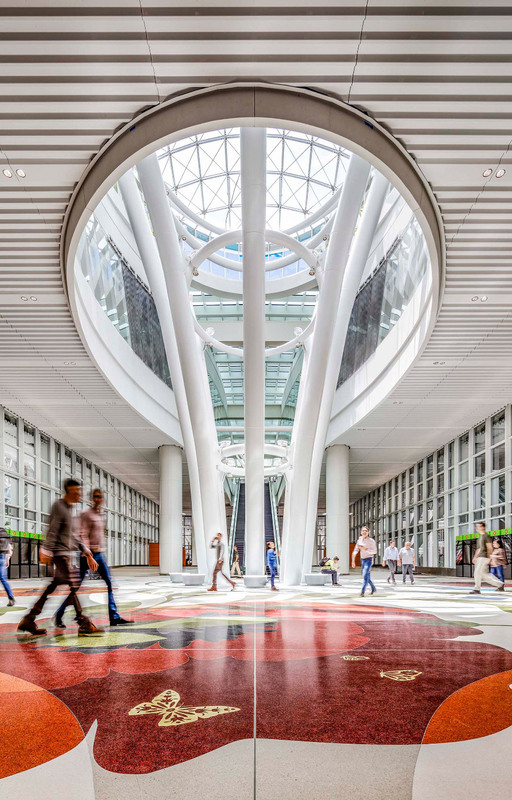 Decades in the making, the opening of the $2.1 billion, 1.2 million-square-foot terminal this August capped off eight years of construction and followed the completion of the 1,070-foot-tall Salesforce Tower next door in February. Taken together, the three elements—terminal, tower, and park—represent the beginning of a new era that, according to the planners behind the transformative project, is driven by a focus on public space and public transit. Dubbed the “Grand Central Terminal of the West” by its civic boosters, the new multimodal transit center is meant to be the crown jewel of a new high-rise, mixed-use, transit-oriented neighborhood anchored by the multifunctional rooftop park and capped off by the tower. The arrangement is one of the many by-products of a far-reaching district plan crafted to embrace the terminal and reshape the city’s skyline. Designed as a massive, skylit, indoor-outdoor living room sandwiched between transit and a park, the terminal is geared for public use first and foremost. Inside its cavernous halls, terrazzo-based flooring by Julie Chang, a light installation by artist Jenny Holzer, and a fountain by James Carpenter enliven the grand and formal spaces designed by PCPA. 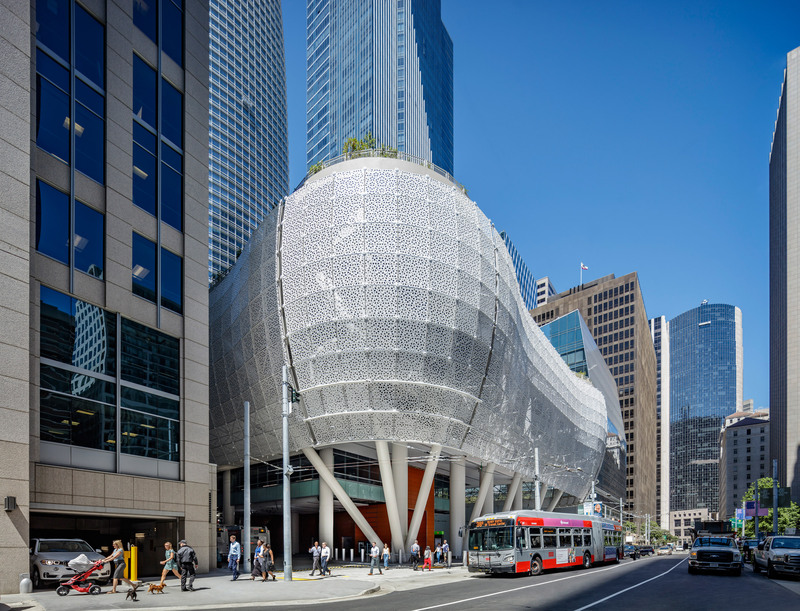 A total of 3,992 perforated white aluminum panels—designed in collaboration with British mathematician Roger Penrose—wrap the terminal, skinning a bulbous, undulating object that sneakily cuts across the neighborhood. The lacey wrapper brings light into a second-story bus terminal and helps to dematerialize the massive complex. This visual transparency becomes physical porosity along the ground floor, where the multiblock building spans over city streets, weaving through the commercial district with its 85,349 square feet of retail space. The expression is quite literal in this case, as the complex begins 125 feet below ground, where a five-block-long concrete box acts as a massive foundation for the complex containing below-grade ticketing, retail, and concourse levels. For seismic resiliency, the 1,000-foot-long terminal is designed as three structurally isolated sections connected by a pair of 2-foot-wide expansion joints that allow each piece to move independently. Thornton Tomasetti is the engineer-of-record for the project and served as a sustainability consultant for the Salesforce Tower project, as well. The also building comes outfitted with one of the largest geothermal installations in the world, according to the architect. It is a design that not only allows for impressive energy efficiency, but also reduces the need for the clunky air handling units on the roof that would typically accompany conventional HVAC systems. Situated 70 feet above grade, the terminal is topped by a new public park designed in partnership with PWP Landscape Architecture. Flower beds and tree pits of varying depths meander around the rooftop, where the verdant park is home to 100 trees, a 1,000-seat amphitheater, three sculptural lanterns, a playground, and a 1,000-foot-long fountain by artist Ned Kahn, among other elements. The stormwater-retention-focused park is also sculpted by artificial mounds concealing elevator overrides and mechanical equipment. Standing beside all of this is the Salesforce Tower, a tapered pinnacle defined by rounded corners, “classical proportions,” and a large crown that lights up with a large-format LED video artwork by artist Jim Campbell. The 61-story tower connects directly to the park and touches the ground with a light, open lobby that is meant to enliven the district, “in a simple, elegant way,” according to Clarke.